Part of the Sacred Harvest Festival experience is spending a leisurely afternoon shopping along Merchant Row. You can find ritual robes, comfortable sarongs, jewelry, drums, and hand thrown pottery. I purchased a beautiful libation cup from Hawkdancing Studio. Some offer services such as energy work or body painting and henna. The merchants are willing to let you shop in silence or strike up a conversation. Some are willing to fill you in on their particular craft while you watch them work. That is the case with Earnest Stevens, known by his craft name Skywolf SingingHeart. 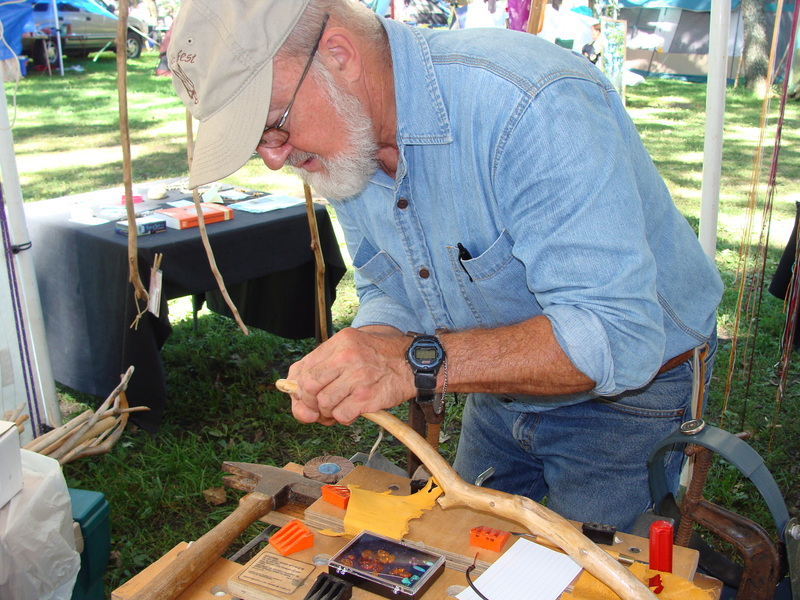 He makes brooms and he makes them only while he is at festivals or on other high energy occasions such as a full moon. If you see Skywolf at a festival and you want one of his brooms, I suggest you talk to him the very first day or you may not be able to get one. The reason his brooms are so sought after is apparent once you watch him work and listen to how they are made. 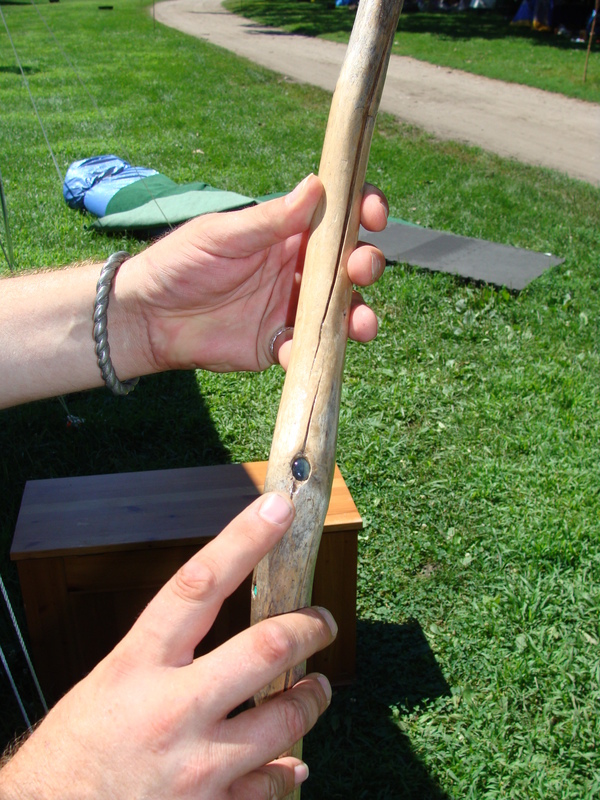 Skywolf gathers the wood for the staffs from Lake Superior and travels to central Illinois for the broom corn. The staffs, broom corn, and his tools are brought to the festival, where he creates only 5 to 8 brooms. 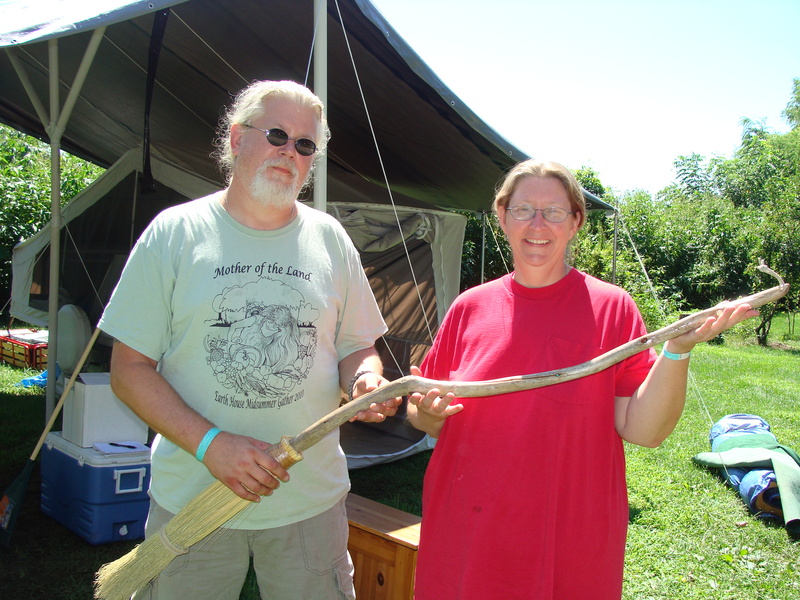 One group receiving a broom at the festival was the newly formed coven, Circle of the Dragons. “When we hived off from our mother circle, we wanted a special broom for our new coven. Something that would truly be us,” said coven member Dragonmyst. He went on to point out the gems in the staff. Gems that were chosen to represent the Gods the coven worships.